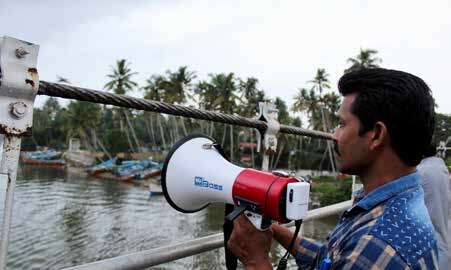 Accurate, accessible and timely marine weather forecasts are of crucial importance in planning and conducting fishing safely around the world, yet this essential information is not easily accessible to artisanal fishers from the South-West Coast of India, and as a result there are persistently weather-related accidents resulting in loss of earnings, equipment and sometimes life. A new policy brief explores why incidents relating to adverse weather conditions are still so commonplace on the South-West Coast of India, and suggests ways these incidents could be reduced. The brief is based on research by an interdisciplinary team from the University of Sussex, who studied two fishing villages in the district – Anchuthengu and Poonthura – between February and September 2018. The researchers conducted in-depth interviews, focus groups and co-production workshops with the locals, as well as tracking five boats for 100 days in each village, recording their fishing patterns in line with forecasts, perceived risks, and local risk cultures. They also tested the accessibility of fishing forecasts and alerts available in the local area and how these affect fishers’ actions. They found that fishers regularly checked for forecasts using different sources and had a good general understanding of weather conditions. However, there was a general mistrust of forecasts within the community and fishers often found forecasts to be too generic and uncoordinated. Furthermore, even when weather conditions were poor and potentially dangerous, fishers frequently made ‘risky’ decisions to go out to sea or to stay out because of the financial losses they would otherwise suffer. The policy brief recommends a number of ways to improve the safety of fishers, highlighting that although incidents increase when there are extreme weather events, accidents are commonplace throughout the year. Recommendations include regularly checking beach and harbour structures that could interfere with fishers’ habitat safety, and promoting safe fishing through local fishers’ disaster risk reduction committees. A number of suggestions are also made about the forecasts themselves; to be useful they need to be more focused on offshore conditions, present more opportunities for fishers’ feedback and be available across channels and forms of media such as print, wireless and social networks.